Life is full of contradictions. An acquaintance once called me “honest to a fault” and I can’t help but wonder how honesty could be wrong. You might think the same goes for “polite”, yet I learned in the 6th grade there are exceptions. At home and Growin’ Up in Maine, I walked to the Derby grammar school for years attending kindergarten through 5th grade. 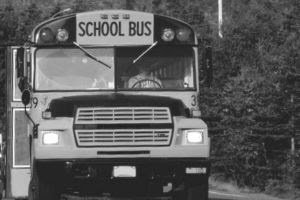 School beginning in the 6th grade was over a mile away in Milo, and those of us in the suburbs took the bus. For my first trip on the return home I learned there are rules for kids exiting the bus. I stepped down and instead of crossing the street in front of the bus, I stood in place and waved the driver on. He waved back meaning I should go first, so I shook my head for ‘no’ and returned the gesture. He opened the door and told me emphatically to cross in front of the bus. “No, that’s okay”, I said, “you go ahead.” Oh oh. His face turned beet red instantly and I thought his blood vessels were gonna pop as he screamed at me to cross the street! Lack of manners backfired again later in life at a local charity function. The organizers announced raffle tickets on sale for a color television, and I stepped in front of a woman to buy mine. I walked away feeling guilty. “You go ahead” would have been more in character, and I would have had the tickets she bought. Yes, she won the television. Given the chance, justice will prevail.